The CEO's new strategy to turn the struggling burrito chain around didn't resonate very well with investors. Ironically, this new strategy is exactly why he was brought in. Shares of Chipotle Mexican Grill, Inc. (NYSE:CMG) are down 8.9% at 12:10 p.m. EDT on June 28, following yesterday's press release and presentation discussing the company's new strategies to reignite growth at the erstwhile high-growth burrito chain. After market close on June 27, Chipotle management held a call with analysts discussing the company's plans to relocate and consolidate its headquarters, the closure of 55 to 65 existing restaurants, its plans for marketing and promotion, and new menu item development. A combination of things likely impacted the market's view of Chipotle's stock following the presentation of its new strategy. To start, the company announced it would close between 55 and 65 existing restaurants, including all five of its Pizzeria Locale locations outside the Denver area, over the next several quarters. The headquarters consolidation, which includes the relocation of its Denver and New York corporate offices to a single location in Southern California, and the restaurant closures and other "unusual items" will cost between $115 million and $135 million over the next several quarters. Even after today's sell-off, Chipotle's stock is one of the best-performing chain restaurant stocks this year, up almost 45%. After multiple years of failing to establish positive traction with eaters, it seems this new strategy has made plenty of investors anxious. The irony is, Niccol was specifically hired to take action and establish a plan to reignite traffic growth in Chipotle's restaurants with food innovation, improved operations to leverage digital ordering and fulfillment, and more aggressive marketing. 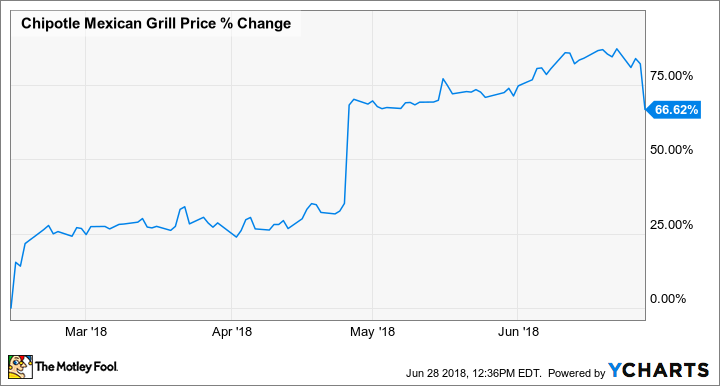 Niccol led a very successful turnaround at Taco Bell prior to Chipotle, improving its relevance with young restaurant goers and increasing sales and profits substantially during his tenure. And he was brought in to do essentially what the market seems to be selling on today: Increase Chipotle's marketing efforts (and likely the spend), invest in digital order fulfillment and delivery partners, and expand the menu to appeal to more customers, including adding items like milkshakes that haven't typically been associated with the burrito chain. The company's strategy also includes driving costs down, and utilizing technology to help drive operating efficiencies higher. Niccol was hired to do at Chipotle what he accomplished at Taco Bell. And while there's little doubt it will be harder to accomplish at Chipotle, based on its "food with integrity" motto and focus on natural ingredients, the company's restaurant economics remain some of the most compelling in the industry, generating margins -- even as they remain well-below the pre-2015 peak -- that are the envy of many competitors. Even after today's drop, Chipotle stock trades at a rich valuation of nearly 49 times expected 2018 earnings. But if Niccol's strategy pays off and Chipotle can start growing traffic again, today's price could look like a bargain in a few years. Can Chipotle execute on this new strategy? We haven't seen the brand get much traction with prior attempts over the past couple of years, but Niccol's history of success is why he was given the big chair. It's time to see if he can do a Taco Bell redux at Chipotle.